Whoever thought that only one night a year of witches, ghosts, and goblins is fair is a dum-dum! Picture a young boy named Michael, living in an Illinois suburb with a blond mop of hair teased high but sprayed red, in a white and blue polka dot clown costume, gluttonously picking through a pile of Krackles, Kit Kats, Smarties, M&M’s, and 3 Musketeers dumped on his bedroom floor, thinking those thoughts. A separate mound of unwanted goodies lies pushed to his side. Outdoors, tree crowns stir in autumnal browns, yellows, reds, and oranges. A carved pumpkin grimaces on a neighbor's porch. The image is stolen from my past. Now, imagine the same young boy a scant few years older, scrambling around his bedroom frantically searching for every stray quarter lost behind his dresser, tossed on a surface, or tucked in any pocket into which he can stuff his fingers. The change is collected for placement in a book-sized folding cardboard coin holder. Nearly every slot on either page of the organizer has a silver George Washington pressed into fitted circular holes. The loot has a purpose; it is bribe money. The word was out. 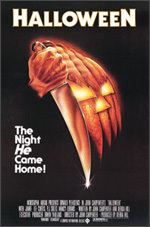 Theatres were playing the scariest movie ever made, a movie called Halloween. And it was not for kids. Please take me to see Halloween. I’ll pay. Almost ten dollars. His treat. In the morning, to great disappointment, Michael's request was denied. “But, Mom. The movie is about Halloween! Halloween is for kids!” he cried. “Not this one. We can go see anything else you want,” she said. The pleading tactic, which usually worked, continued without much effect. Michael worried that the movie would end its run, before he got his way. A few days later in a last-ditch attempt, Michael approached his mother face-to-face, like a grown-up, with outstretched arms. Cupped in his juvenile hands was loose change. He upped the ante, saying he would buy popcorn and Cokes. They left for the theatre the following evening. The sight of a young boy, also named Michael, wearing a Halloween clown outfit, residing in Haddonfield, Illinois (that had to be close to the real Michael's hometown! ), but wielding a bloodied knife, crossed the boundaries of youthful comfort. The remaining eighty minutes of the film, leaving no doubt that the boogeyman exists, left a surpassing impression. Events sprout upward in a lifetime like the branches of an oak tree decked with leaves, which eventually cascade upon fallow lawns, get raked into a heap, and burn in a harvest of dried ground cover. Halloween is neither frivolous, nor seasonal. The film is unforgettable, and without knowing it, Michael, the one who bamboozled his mother into taking him to see the most terrifying movie ever made, finally got his wish that fall night at the cinema. Halloween, rife with sinister new associations, creeps up for observation on more than a single day each year.